News, thoughts and ideas around Geocaching. Based in Melbourne, playing all over Victoria. For the purpose of this exercise I'll show what I did while placing The Black Mesa Invasion - GC2Y70N. Finding a location can be very easy - or very difficult. Easy would be to just stumble upon it: You could read about it in a book or you come across it while hunting for another cache. If you look for certain features of your location it is difficult. E.g. you are searching meadows with scattered trees and a little lake ... it's not that easy and most of the times a cache has already been placed there. I make excessive use of these three websites for scouting: Google Maps, Nearmap and Parks Victoria. If you find something which could be good, check for caches in the area first. The guys at GCA created a very good feature on their maps page: Just tick the box "Proximity" and it shows you a blue circle around every cache which has the 161m radius. If you have areas with Multi or Mysterycaches the only thing you can do is find them and use this tool. All good? On to the next point. How did I find Blue Rock Lake? Pretty simple: I went for another cache in the area and took a little detour afterwards. Right away I knew that I so have to place a nightcache in that unreal scenery. A nightcache can't be a traditional cache (well it can be in theory but that's very tricky and I haven't seen it). This means you are placing some sort of multiple stage cache and that really works good if you can match the stages to the location. By "story line" I don't mean you have to create a Pulitzer Prize book - I mean if you do that'd be even better. No, I just want to say that the stages should be in some sort of logical order. It's not really fun if you run back and forth in a suburban park where a nice round-trip would have been possible as well. See? So far that isn't any different to placing a normal cache but now comes the twist: Before you place anything visit the area during daytime. It gives you a much better overview and feeling for the whole place. You can place a nightcache during at night but I wouldn't recommend that. Alright: You got your location and you have a rough idea which way you want to lead the nightcachers. Let's get some material in the wood. Since Blue Rock is a bit away from Elwood I wanted to place the cache in one day. I used whatever pictures I took from my first trip and Google Earth to determine six to eight places for a stage. I also marked some things which looked interesting and worth checking out for a stage. I decided to go for a one-way ticket because I wanted to have the cache-box in a more remote area. In the end I used only half of the points . 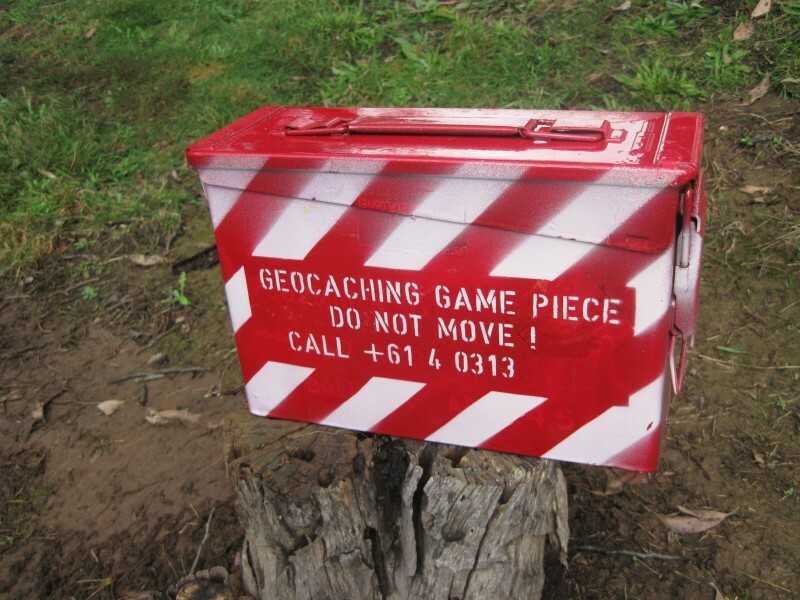 There are not many nightcaches which work without any additional material and just have the cache-box - lighthouses or some city lights would do the trick but normally you have to install some sort of stages. If you use reflectors - here is a link how to build them. It's not exactly rocket science but it's work which is easier done at home. Also the cache-box itself needs some preparation. A nice standard is a small ammo can, a 2L sistema box, some spray cans and a self-made stencil. Now here is a short how-to-make-you-own-stencil: Design something on a piece of paper - if you use a computer and need a font use the DIN Schablonierschrift. Take that piece of paper and laminate it. The fun part is to cut your stencil with a carpet-cutter. Yes this takes a while :o) After you have punched all the holes into it you can start to prepare everything. Spray the backside of the stencil with hairspray (DON'T spray the cachebox!) and "glue" it to the surface. This way you get a sharper edges. Now you can use the real paint and spray the stencil. You got all the reflectors or stages. You got a cache-box and you have a plan. This should be pretty straight forward, shouldn't it? Maybe. Maybe not. It could be that all goes to plan and you can place all stages and the cache at once but it doesn't have to be this way. It could be that one stage doesn't work as you planned it for whatever reason. Now it's the time to be prepared for adjustments. I suggest to have tools in you backpack which allow you to create a stage from scratch. Being familiar with your tool-box in the field is a real plus. 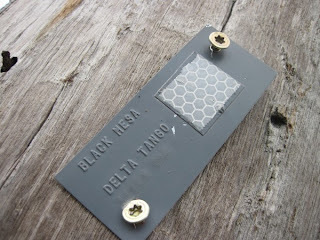 I had to create one tag in the field to make sense out of the prepared tag so the cachers get a set of coordinates. In order to be able to create that tag, I had to place the cache-box first. Effectively I placed the whole cache in a reverse order (Final - Stage 7 - Stage 6 - ...). No matter how well you prepared in advance and how nice your cache turns out to be, there could be something which prevents it from getting published. It could be a final of a far away puzzle-cache or some local legislation you didn't know about. Keep in mind that it might take several trips to get your cache on the green side. If you don't want to do that, then don't place a cache at that location. Contacting your local reviewer in advance is always a good idea for any bigger cache project. This way you can prevent disappointments and you'll see that they are very helpful as well. To find their account just click on a cache close to you and scroll down to the publish note. Fortunately I didn't run into a trouble with this cache but the very next Black Mesa cache had a conflict with an existing cache. There was no way to get around driving out there again and moving one stage. That said - this is only how I placed that cache. There are a million ways to create a good cache. If you like a certain cache and you want to place something similar, there is nothing wrong with that. E.g. it took me a long time to come up with my current reflector/tag design. It's simple and it works - why not using it for your nightcache?